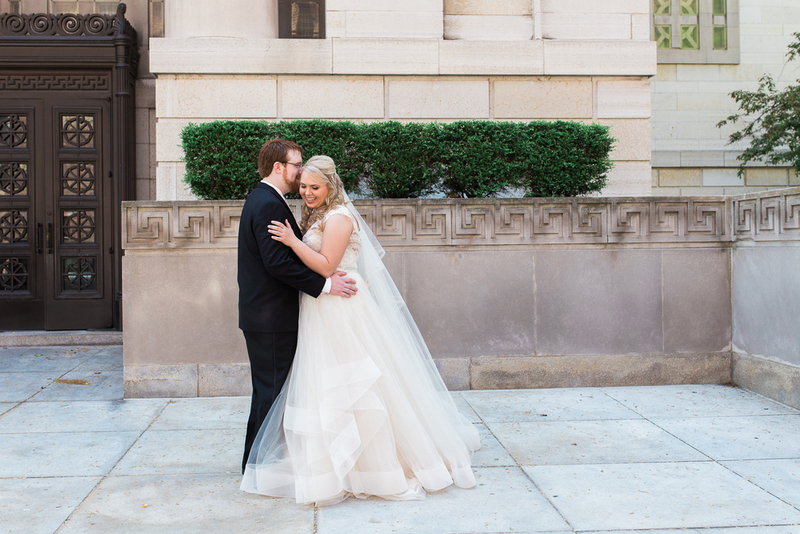 Michael and Maggie's wedding was the perfect balance of elegance and tradition with the most stunning details! But what I loved most about the day was the emphasis on family. Every moment of the day was spent surrounded by the people that love them most, and those are the memories that they will relive. If every wedding was this gorgeous and meaningful, I would be oh so happy. Rachel Lisa did an incredible job on makeup...I could not recommend them more! I mean can you get any more timeless and gorgeous as Maggie? Her dress had me drooling all day. I'm a sucker for stunning churches, and St. Peter in Chains did not disappoint! I come from a family of girls, so watching Maggie enjoy the day with her sisters was so special. I also loved their bouquets! Adding a touch of color with long flowing ribbon is always a good idea. How did the two of you meet? We met online. After exchanging many messages that could probably pass as books, we met up at Barnes and Noble café and played card games all afternoon. For dinner, we ended up going over to the nearby Panera and stayed there until closing time talking – neither of us wanted to leave. The story would be incomplete without mentioning one of the older employees that challenged us to a presidential trivia game, which we more or less completely failed. It was rather hilarious and we ended up with free pastries, so we’d call that a win! Tell me about the proposal! I (Michael) was in Florida last summer for an internship, and Maggie came down to visit me for her birthday. Given that we knew roughly when we were going to get married, Maggie knew I was going to ask soon – just not when. For all she knew, I was waiting until I came back home to ask for her parent’s blessing as well as for us to go out and pick her ring. I had already asked and had bought a “placeholder” ring to propose with. Initially, I planned on taking her to the beach for a romantic, sunset picnic, however we found out too late that the beach would be closing before sunset and found out on the way there that we’d be accompanied by a pleasant thunderstorm. We were able to catch a break in the storm to have our picnic, after which I popped the question when the storm sirens started back up. I had her caught off guard so much – and putting the ring on the wrong finger probably didn’t help either – that she had no idea what was going on, let alone whether or not I was actually proposing or just giving her a promise ring. Whoops! We made it off the beach and home safe, calling family and friends on the way home, and ended up going out for probably the most delicious dinner we’ve ever had. Maggie's rings were a custom design, and I have never seen a ring so unique and utterly beautiful. Great job Michael! Because Michael and Maggie had a morning ceremony, we were able to take our time with portraits after the reception. It made the day much more relaxed, and the lighting was perfect! What were you most looking forward to on your wedding day? The cake, hands down. That thing was delicious (Michael). Actually getting married! I can’t wait to be Mrs. Michael Downing (Maggie)! Michael and Maggie, thank you for inviting me to take part in your special day. 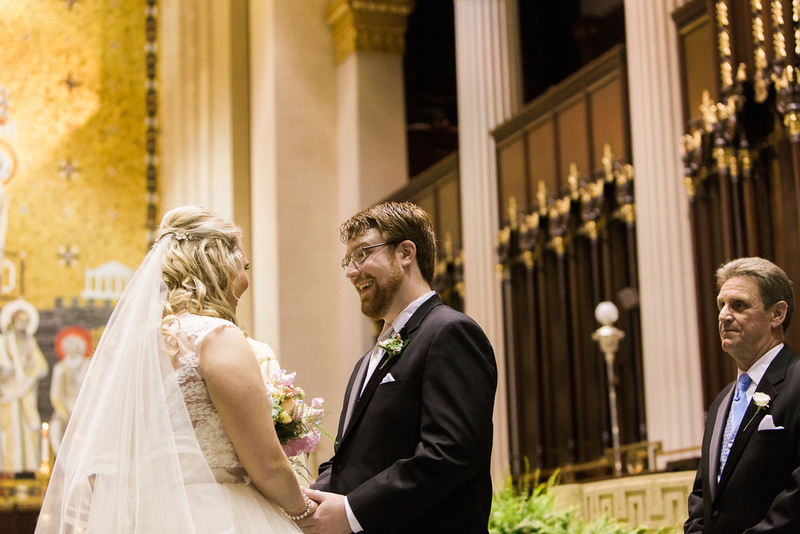 I could not have asked for a more perfect start to my wedding season. I am so thrilled that you are chasing after your dreams and beginning your next chapter in a new state. I cannot wait to see where God leads you!